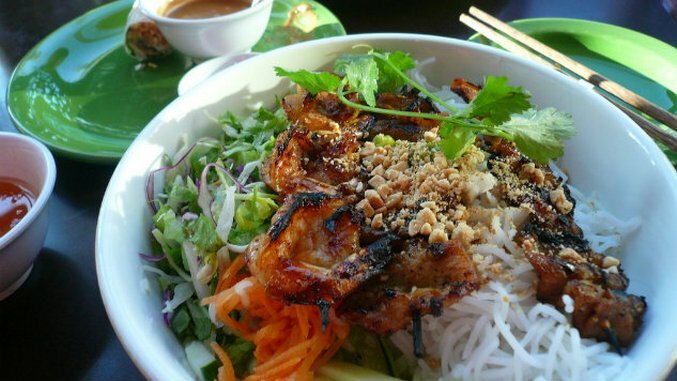 Sweet, spicy, sour, fishy, pork-based — what wine do you drink with Vietnamese cuisine? Being a non-wine producing culture, there’s no easy region-to-region pairing for Vietnam’s food. Here are five ideas from around the globe. New Zealand produces some intense fruit-forward Sauvignon Blanc with strong herbal notes. These wines had their it moment in the nineties. If you’re a millennial you probably missed it and may not have given these much thought. For those of you who fear fruit forward wines, now is the time to get out of your comfort zone. A wine with some ripe fruit will pair much better with the sweet, spicy, sour trifecta. A big white like this can even hold it’s own with fried foods and N? ?c ch?m (dipping sauce). Some California Sauv Blanc would also fit the bill, but avoid those inspired by the more austere French style. Cloudy Bay 2014 Sauvignon Blanc is an example of the standard. If you are an Asian food-loving oenophile and/or happen to be heavy-handed with the hot sauce, then you should keep a bottle of this in your fridge (or in your bag, swag!). One quality I love about German Riesling and well-executed Vietnamese fare: clarity of flavors. And don’t be afraid of off-dry varieties. Like the perfect lemonade, high acid rieslings with a bit of sweetness don’t come across as cloying and won’t clash with the spice in your dish. Try the Leitz Dragonstone Riesling 2013. Malbec is Argentina’s flagship wine, but it’s lovely floral white is also beloved by international consumers. Torrontés pairs nicely with lighter dishes like ch? giò (imperial rolls). Usually under $20 a bottle, it is a good value wine to add to your repertoire for aromatics. Look for one made in the northwestern region of Salta, because the cold dry climate is particularly good for this grape. Go for the Crios de Susana Balbo Torrontés 2014. You probably won’t find this red Italian frizzante on the wine list at a Vietnamese restaurant, but if you’re cooking at home or ordering take-out then consider serving this alongside Vietnamese pork dishes. Because of the inherent sweetness of pork and herbal flavors essential to Vietnamese, you don’t want to go to crazy with the tannins lest you make your pork taste bitter and overshadow the herbs. This soft and fruity red shouldn’t result in any unfortunate bitterness. In addition, Lambrusco is often low in alcohol so you’re less likely to jack up the heat to an unflavorful burn. You’d be happy pairing bún th?t n? ?ng (grilled pork with rice vermicelli), with a Lini 910 “Labrusca” Lambrusco Rosso, NV. New world Pinot Noir is generally lower in tannins, but be sure to check the alcohol levels here. Low alcohol is the way to go with Vietnamese so as not to interfere with sweet or herbal notes. Look for something under 13.5 percent. Try it with pho’s rich beef broth or sip while enjoying some nem (sausages). An excellent pairing would be the Belle Pente Pinot Noir 2013. Don’t let those big Vietnamese flavors intimidate you — if you love wine and Vietnamese food, you can find a pairing for the salty, sour, sweet, spicy, pork-and-shrimp-obsessed dishes. Katie Le Seac’h is a freelance writer and sommelier living in Brooklyn. She writes about wine, food and parenting.